What's not to love about these witty little badges? Lisa Kearns crafts the trusty old name badge into amusing little ditties such as "Hello, Very Busy Very Important". Bound to make even the crankiest co-worker smile our only problem is deciding which one we want! Kevin Murphy shampoo is something we at LoveBento swear by. Not only does it smell like you are in a day spa is leaves your hair so soft and luxurious washing your hair no longer feels like a chore! Just pop over to his website, check out the hair type guide and presto you will have shampoo that suits you to a tee. The Melbourne International Arts Festival always heralds the revamping of the Arts Centre forecourt and, for the last few years, it has been the hub of the festival with the weird and wondrous spiegeltent. But this year sees a change. Commissioned for the 2007 Venice Biennale Melbourne artist Callam Morton's amazing Valhalla graces the forecourt. With echoes of a Melbournian childhood mixed with a video games aesthetic Valhalla is one thing you must experience this MIAF. Nothing beats a big bunch of flowers. And you will never be disappointed with the gorgeous array of flowers from Pollon. From potted succulents to the biggest peonys we have ever seen these bouquets are guaranteed to make anyone smile. So don't wait around for someone to buy you a bunch nip down to Flinders Lane and bring spring inside. Love. Kids in Berlin is one of LoveBento's most loved. 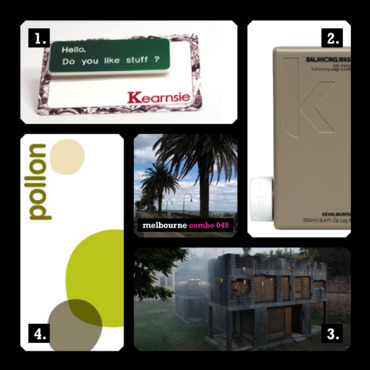 Stocking almost eighty Australian designers (including LoveBento favourites 'Who am Eye' and 'Madz has Runaway') this is North Melbourne's style mecca. With a vast collection of limited edition t-shirts, Kids in Berlin is a must visit. Shopping love. As much as we love a fancy night out, we also love the comfort of food that tastes like it's come from a family kitchen. And Wabi Sabi Salon delivers us just that. With top trained chefs from Japan working away in the kitchen and friendly staff that guide you through the menu, Wabi Sabi is a firm LoveBento favourite. Our new favourite haunt for crafty goodness? The Local Shop on Northcote High Street. With fresh flowers wafting through the air and a gorgeous array of locally crafted delights, this is the perfect place to buy a present for someone special. So take your time, sink into the huge lounge chair and ponder how to spend your pennies. 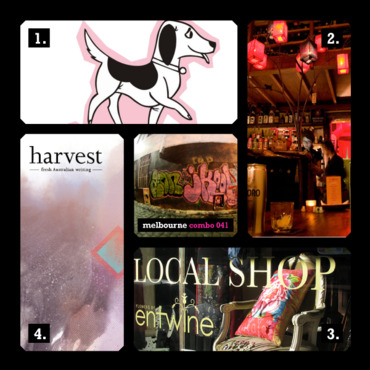 In the depths of winter, Melbourne-born magazine 'Harvest' has released another edition for us to curl up with. With articles on the spirit of adventure and life's waylaid plans, this is one literary magazine that will have you yearning for the next edition. You've got to check out this funky stationary. Nothing speaks love like a reminder card with YOU ARE NOT UGLY on the cover. But it doesn't stop at gift cards - they've got fun pens, drawing books, decorative tape, badges and watch bands! Enough to keep even the most expert art-types intreagued for days. Love it! There is jewellery you wear on weekends, jewellery for special occassions and then there is Victoria Mason, which you'll want to wear everyday. This Melbourne designer produces beautiful metal rings, earring and necklaces that depict tiny version of real life. We especially love the Say it with Flowers necklace! As daylight savings stretches our days into late evening nothing is more Melbournian than a rooftop drink. At Cabinet bar the cocktails are made to perfection, the wine list is delicious and the food is more than simply bar food. We recommend getting there early, grabbing a balcony perch and sharing the bruschetta - bliss! 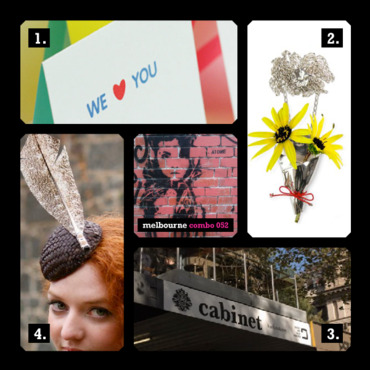 There's no better way to finish up the Melbourne Spring Racing carnival than with a new fascinator, hat or head-piece from Bird Millinery. With a collection dedicated to this year's festivities it's well worth checkout out these sophisticated, unique designs.